The secret of Angeleri Canestrelli lies in the simplicity of ingredients and adherence to the traditional recipe, which Pasticceria Angeleri has been using since the bakery opened in 1912. 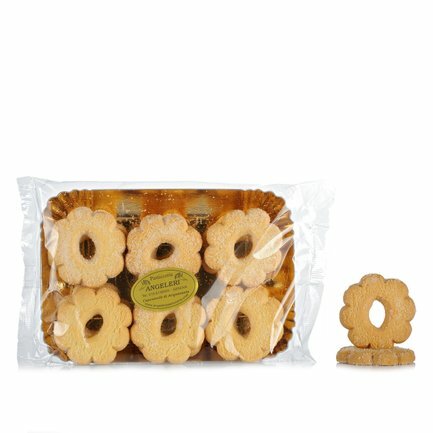 These exquisite traditional Ligurian biscuits are made from Italian tipo 00 flour, butter, sugar and eggs, lovingly handcrafted to create a truly authentic product. An original ideal for a delicious gift, a wholesome breakfast or a tasty snack. Ingredients 00 type flour, butter, sugar, eggs. ALLERGENS: cereals containing gluten (wheat, rye, barley, oats, spelt, kamut, or hybrid strains) and derived products, eggs and egg-based products. For more information on product labels, please contact our Customer Service department. The information on the labels of the products may vary for reasons beyond our control, therefore, there may be discrepancies between the information on the site and that on the products delivered. Please always check the information on the product before consumption or use. Angeleri means quality, authenticity and attention to detail. That's why Eataly chose these delicious products made by the Genoa firm, engaged in the artisanal preparation of confectionery products from only the finest ingredients since 1912. Only carefully selected ingredients are used to reproduce classic traditional recipes. Savour Angeleri's specialities and taste for yourself!